I am starting a series of paintings for the May show at the Two Bird Cafe. I want people to feel like they are out in West Marin when they are eating... The lighting, the colors, the panoramic views. "Muralesque"... I want the paintings to have an impact. 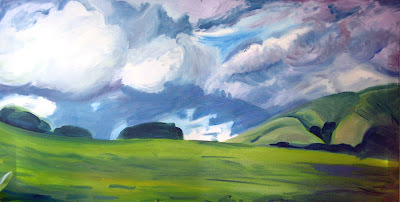 There will be smaller paintings to fill in the gaps between the larger scenes of West Marin. This painting, as it stands, reminds me of Louisa Matthiasdottir, an Icelandic born painter. I was lucky enough to see a show of hers in Iceland in the 1990's. Having seen the stunning country from which she drew her inspiration was a privilege. 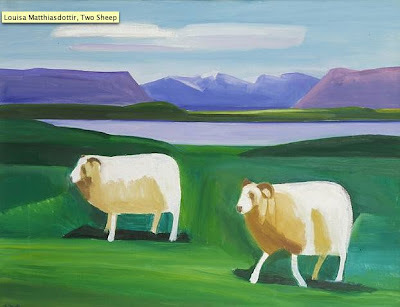 If you ever have a chance to visit Iceland, or view the work of Matthiasdottir, both are well worth the trip. Here is an example of her work from the 90's that I was very attracted to; Her work has been described as "using restraint", and "crisp". I couldn't agree more. It is challenging for me not to paint what I see, including lots of detail. I find her work amazing in her choices to leave out detail, and create a bold and striking scene, nonetheless.